Dr. Tchecknavorian We want to express our highest gratitude to Dr. Tchecknavorian, who has been permanently fighting to get the obsolete pesticide issue on the international agenda and has engaged herself on the highest level to move the issue forward and worked many times in our resolution team during the past forums. 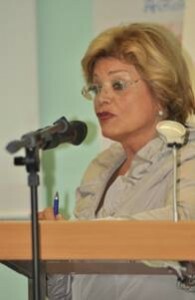 Dr. Tchecknavorian has been a key person in the development of IHPA and she has with her personal strength and expert knowledge guided IHPA to a prominent position in the international community. Dr. Sugavanam We want to express our highest gratitude to Dr. Bala Sugavanam, who has been the engine for the last decade to edit and promote the POPs Newsletter. He has started the work from nothing and was able to create a group of several thousand newsletter readers. This growing reader group is and will be vital for the general public and for the specialists in the field of POPs. Dr. Sugavanam has this year handed over the editorship of the Newsletter to Prof. Dr. Md. Mahbubar Rahman, but is still active with his contributions to the Newsletter.